A very affordable blend of ES-335 tones, but with a snappier Tele edge that really opens this guitar up to myriad playing styles. The vintage looks, bigger frets and brilliant semi-hollow fit, finish and tone. 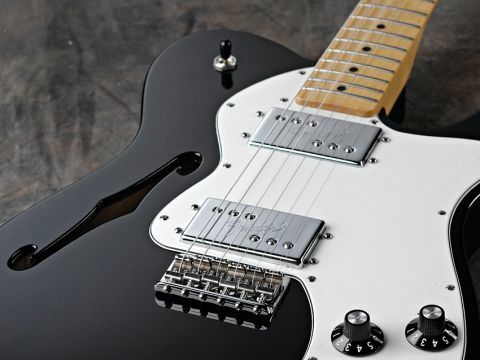 The Thinline Deluxe combines two of the guitar world's most classic designs - the Telecaster and Gibson's ES-335. In the construction stakes Fender has excelled with all the Classic Player series guitars, but the Thinline is even better. The overall fit and finish is genuinely superb, especially considering its price. Moreover, a silky black finish is entirely blemish-free, even around the tricky f-hole. Just like the original, we have a more traditional slab Tele body - unlike the solid Deluxe there's no belly contour. However, thanks to its semi-solid design, it's light and comfortable; even lighter than many originals we've encountered. "Blues players, this is your Fender/Gibson hybrid sound." Meanwhile, its distinctive and shapely, off-white pickguard gives this Thinline that desirable vintage vibe, enhanced by its correct, early seventies-style Tele neck and headstock. We also get Fender's modern, flatter-than-vintage 9.5-inch radius with bigger frets along with the original-style six saddle bridge. In addition, the neck features four, rather than three bolts. Strummed acoustically, although the Thinline's intrinsic character is very similar to the solid, humbucker-equipped Deluxe, because of its semi-hollow construction it's less dense sounding with an airy, swirly tone. Clean, the bridge pickup's soft low-end and bumped mids help mellow this sprightly guitar. More gain gives individual notes plenty of cut and thrust, while open chords sound lush, thick and resonate in typical semi-hollow fashion. There really are few limits tonally. Sticking with the overdrive, the middle position offers sweet and snappy Gibson-type tones, perfect for edgy rhythms - blues players, this is your Fender/Gibson hybrid sound. The neck offers a creamy mid-range with ES-335-like thickness, which carries a similar single-note, airy resonance. Overall, the Wide Range humbuckers aren't as hot as a modern ES-335 and are brighter and snappier, in true Fender style. This guitar represents astonishingly good value. It takes two iconic models and brings a real Fender-y take on the ES-335 format that will surely appeal to both traditional Tele and Gibson semi-hollow lovers.